Datawake was named for a central theme of this project: slurping information from a wide variety of sensors, presenting it on a console, then leaving a wake of data astern. 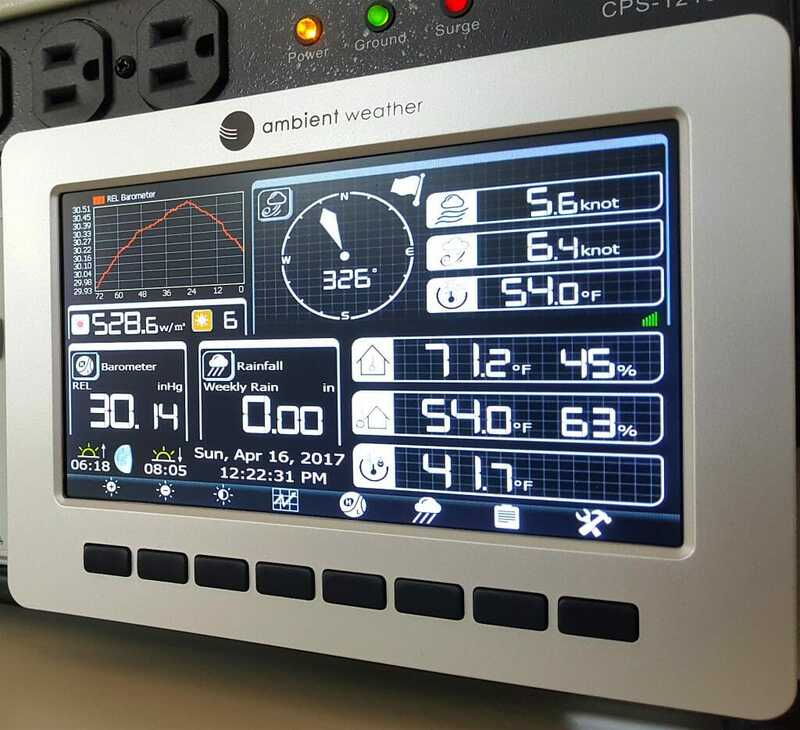 “Sensors” come in many flavors, and I use the term to include status bits, temperatures, radio traffic, video, navigation data, network and server logs, motion detectors, and anything else that conveys the status of the environment… including the weather. 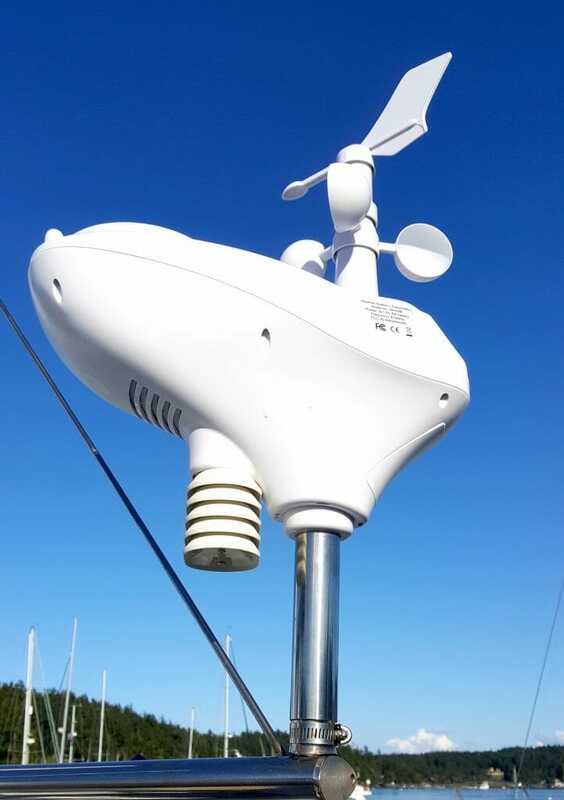 I’ve wanted a weather station on the boat for a while, but every time I started to research the options I got overwhelmed. There’s a lot to learn, including which products are poor, hard to use, or expensive to integrate… and last week I almost back-burnered that quest yet again. 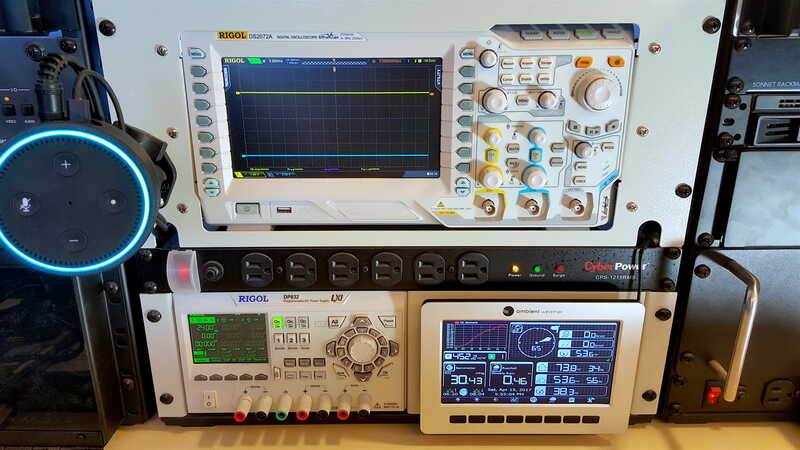 But I started noticing references to this Ambient product (often referred to as a “clone” in the weather geek forums, as it is made by Fine Offset in China), and found myself attracted to the display. It is much nicer than the ones that look like they were made in the ’90s, or those that do “fake color” with filters over a monochrome LCD. This actually looks sweet at about $300, and the size was perfect. At first, my intentions were simple. 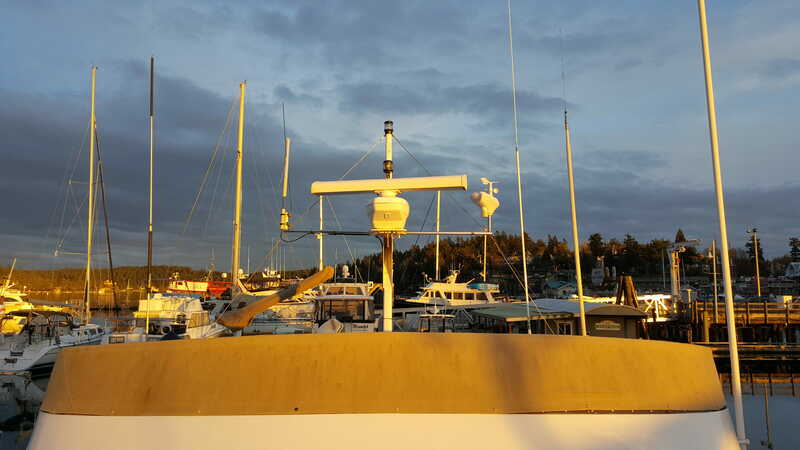 I’d mount the sensor pod on the upper deck, stick the indoor sensor somewhere, mount the display on the wall where the Circle of Fifths clock used to be, then sign up to feed my data to Weather Underground. This is all turn-key with the product, and I planned to turn on logging to the internal Micro SD card so I could extract raw historical data down the road. But the project quickly became more interesting with my friend Steve Mitchell of Sailbits visiting from Seattle. First things first… we couldn’t tinker with this until it was generating data, so I clambered topside to consider options. Fortunately, there is a stainless stub at the end of one of the spreaders on my radar mast, and with a bit of digging around the raw materials inventory I found some clear vinyl hose that perfectly filled the gaposis between that and the sensor array support tube. And by “perfectly,” I mean that it was an interference fit into the tube, and clamped solidly to the post with a hose clamp. Easiest topside mounting job ever, and it doesn’t even need wires! It does have to point north for the wind direction to mean anything, so I fine-tuned it with my hand-bearing compass and tightened it down. That solar-powered unit provides wind speed and direction (including gust information), temperature, rainfall (self-emptying), solar radiation, UV, and humidity. The indoor sensor pod sends air pressure as well as inside temperature and humidity. If you are interested in studying Steve’s weeWX implementation as well as additional context from his decades of experience with this kind of data, he has a post at Sailbits that gives a much more detailed explanation. If you are interested in replicating all this to add to the fine-grained weather-reporting network, I am very pleased with the Ambient 1001 used here… and they also have the WS-1200-IP that would have slightly simplified the process of getting the HTTP output stream into a useful piece of local code. Still, it is pretty much locked in their ecosystem, requiring work-arounds to accomplish the kinds of things Steve did… so if you want to replicate this, I do recommend the 1200 (almost the same price, with all the same features plus that added ObserverIP box). Steve’s article gives lots more information about how to take it from there.